Warsaw Dance Theatre was founded in January 2008 by the artistic director Aleksandra Dziurosz (D.A. hab.) – choreographer, dancer, contemporary dance teacher and academic lecturer. The inaugurating performance of "Chopin – ex-saturo", with the music of Fryderyk Chopin, took place during Chopiniana – VI Days of Fryderyk Chopin on July 28th 2008 at Łazienki Królewskie in Warsaw. In December 2008, "Trwa-nie" premiered at the Warsaw Dance Night. It was the second production of Warsaw Dance Theatre. The Warsaw Dance Theatre performed their third piece "Ex-it", during Com' in Festival, in November 2009. The premiere of "Contrasts" – with beautiful Polish traditional folk music – the next performance – took place in the Grand Theatre-Polish National Opera in Warsaw on June 30th 2011. The next performances were: "Angels" (2012), „Few Few” (2012), "action.CONTRaction.REaction” (2013), "Pink Noise" (2013) and "Performer" (2013). Since 2014 Warsaw Dance Theatre has performed on stages in Japan (Iwata, Tokyo), Czech Republic (Olomouc) and Poland (Warsaw, Wroclaw, Poznan, Ciechanow, Kielce, Minsk Mazowiecki, Olsztyn, Ostroleka, Plock, Przasnysz, Radom, Rybnik, Siedlce and Zabrze). Bartosz M. Martyna with the "Performer" won: Award of Olsztyn Meetings of One Actor Theatres (2014), I Prize of XVI Theatre Arts Festival in Rybnik (2014), Award at the XII National Review of Contemporary Monodrama in Warsaw (2014). The performance "action.CONTRaction.REaction" was nominated for the Wroclaw Music Award Polonica Nova (2014). The main goal of the Warsaw Dance Theatre is to promote the art of dance as a form of expression and to build a space for dialog with the audience. 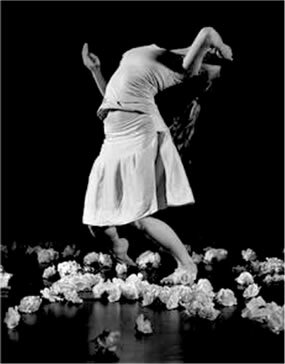 The company aims to create contemporary performances of dance theatre, based upon an interdisciplinary attitudes to artistic output, which develops new and unique dance forms, and builds up contrast with classical ballet, as well as allows to cross the boundaries of classification, technique and style. The Theatre of Aleksandra Dziurosz has a pluralistic form that combines dance, movement, theatre, music and visual arts through creating performances and performance activities that go beyond traditional theatre space – in the places where this kind of art is rare or absent. While the director of the theatre guides the general shape of performances, the members of the company also make an artistic contribution. The Company is comprised of professional contemporary and classical ballet dancers. The Company is, however, open to inviting new and visiting artists (dancers, composers, musicians and actors) whenever possible. Currently, the company is based in the Mazovian Institute of Culture in Warsaw.